Despite having to put up with overcrowding trains as well as trains arriving two hours later, I did make it to the last Christmas market on my places to visit list- in Frankfurt am Main. A couple of interesting points about Frankfurt that one should know about: First and foremost, there are two Frankfurts- one in the western half of Germany in the state of Hesse, and one in the far eastern part of the state on the border to Poland. When the Iron Curtain sliced the two Germanys into two resulting in 45 years of hostility between the Communists and the Westerners, the people in the eastern part of Germany (known at the time as the German Democratic Republic) could not imagine that region to not have a town called Frankfurt. Therefore, they fought to keep the name Frankfurt, which after the Reunification of 1990 became known as Frankfurt an der Oder. Both Main and Oder are rivers that flow through the cities respectively. Another point about Frankfurt am Main that is well-known is the fact that the city is the third largest in Germany (in terms of the population), is the headquarters of the European Central Bank and the German Stock Exchange (DAX), but yet despite being the largest city in Hesse with a population of over 600,000 (minus the metropolitan area), it is not the capital of the state. That honor goes to the one of the Twin Cities straddling the Main and Rhein Rivers, Wiesbaden (ironically, its sister on the other side of the rivers, Mainz is the capital of Rheinland Palatinate). 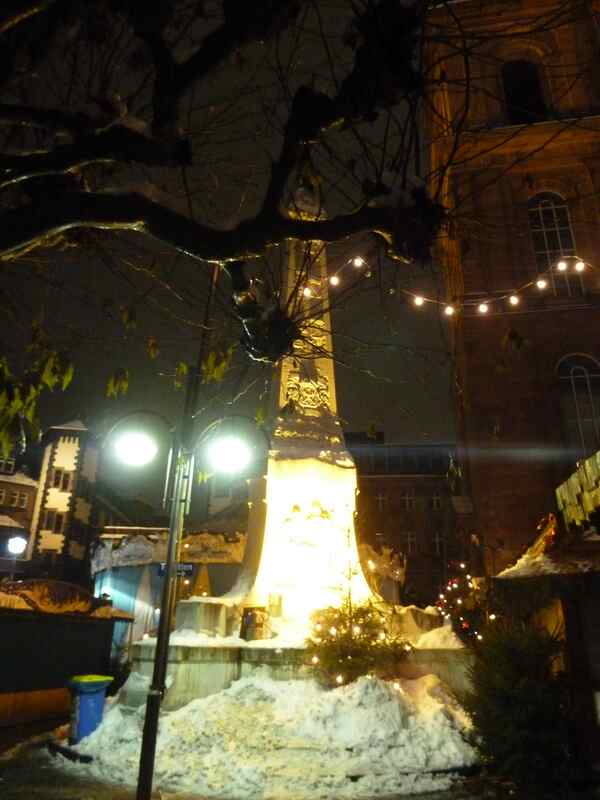 The Frankfurt Christmas Market, which is located along the Main River at Römerplatz between the St. Paul’s and St. Nicolas Cathedrals was touted by many as the cream of the crop with regards to the Christmas markets in Germany- even more popular than the Nürnberger Christkindlsmarkt. Yet still, despite its size and various shops located in three different areas around the two churches, the market still offers the same goods as the ones in Nuremberg and Erfurt, which doesn’t really make it that spectacular to begin with. Furthermore, for those who are claustrophobic, most of the area is located in tight quarters, which does not provide for some breathing room to manoever; especially when it is on a Saturday, when most of the people do their Christmas shopping. It is even more depressing when the weather is gloomy, as it was the case when I visited the market. 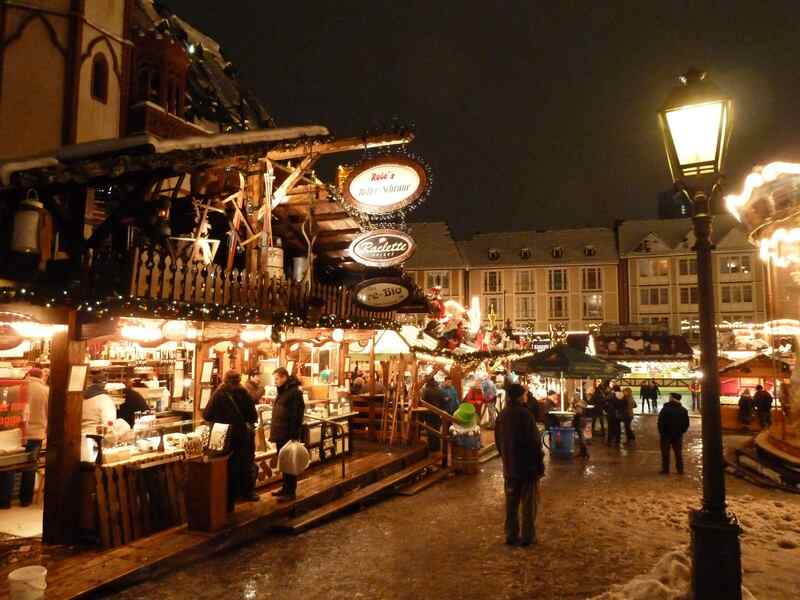 And finally, for those wanting to stay longer at the Christmas market- meaning beyond closing time for most shops- so that they can enjoy their last cup of GlÃ¼hwein, they are more or less screwed for when the clock strikes 9:00 at night, the shops and food/drink areas close almost simultaneously! It is not like in Bayreuth, where Winterdorf is open longer than the shops, or in Erfurt where every food and beverage stand is open longer than the shops (even at Domplatz). This caused some considerable anger among those wanting to grab one more Glühwein or visit one more food stand only to find that the lights are shut off and the windows and doors hastily shut right before their eyes! I found the experience to be rather disappointing for someone who has visited the market for the first time but has seen other Christmas markets that were more flexible and relaxed than this one. I can imagine when the market is open and in full action that a person can get a considerable amount of aggression after a short time, which is easily comparable to the market in Nuremberg although the latter is more genuine than the one 3 hours to the west (by train, that is). For a person living in or near Frankfurt and does not like to travel that much, this market will provide people with a taste of typical German goods, although almost all of them originate from the south and far northwest of the city. However, if one wants to see a real market and find genuine goods, than they should look elsewhere as there are enough places to go around. 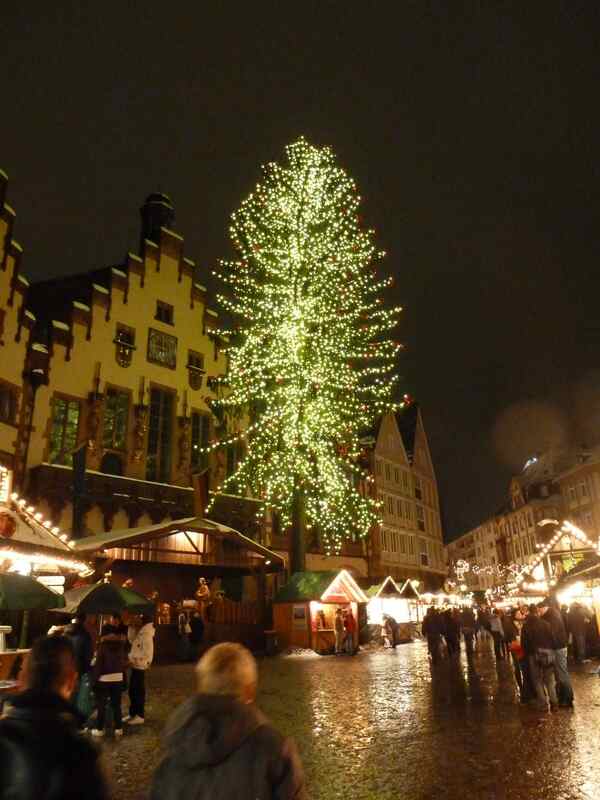 It does not mean that a person should avoid the Frankfurt Christmas Market altogether. 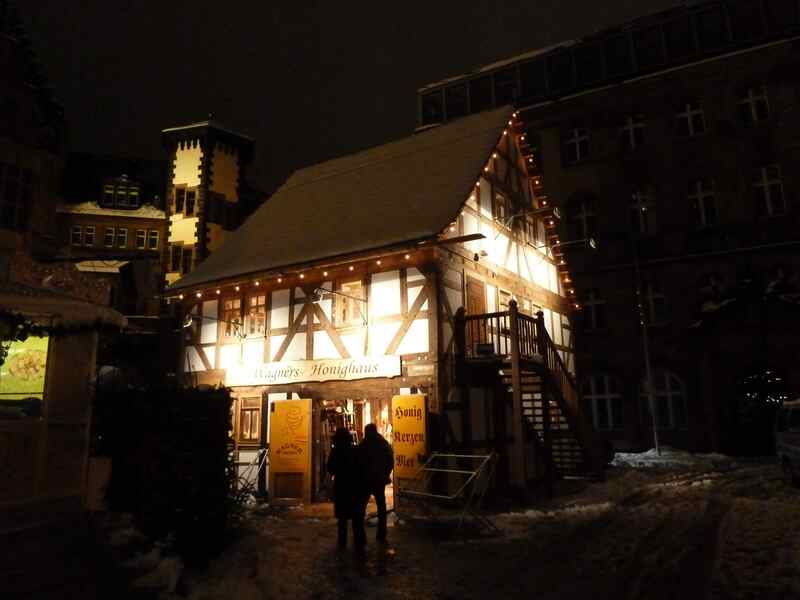 One could use the place as a venue for meetings over Glühwein and pretzels or other local specialties from Hesse and the surrounding area. The people at the stands would benefit from listening to all kinds of negotiations that take place in front of them, while at the same time, listen and learn the different languages, such as English, French, Spanish, Arabic, etc. It is also a place for any last minute Christmas shopping ideas, although you have to put up with some elbowing and some lectures on how to be polite, which is something that many in Frankfurt have forgotten about. 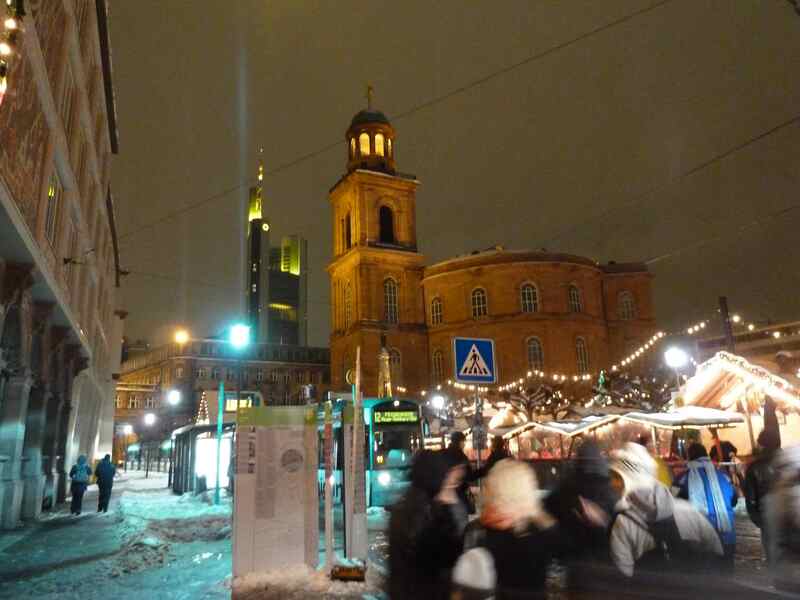 But like the city itself, the Christmas market is something that you see only once and never again. It is like living in the city- you only live there for a short time and then you move on to greener pastures unless you are: 1. A naturally born city slicker, or 2. You were born and raised in Frankfurt and you would never trade it in for anything else. With that said, I went back to the hotel where I could try and get a good night’s rest before taking off for home, which is in the great state of Minnesota. As I was going back by light rail and subway, I was thinking of the events that occurred earlier in the day, where I befriended a German police officer who originates from Saxony but works in Frankfurt, and her company I got while drinking a coffee and a Glühwein, while waiting for the next ICE Train to get us to where we wanted to be. I thought to myself that good company from someone you never met before can create paths that you never knew existed. Seeing the Christmas markets in Germany are only a side dish to having some good company from your family, friends, and people you meet along the way. There are times in your life that people come in and out and don’t think about who you really are until they’re gone. However there are some who come into your life and stay there because you are who you are and they like you for that. This was probably the most rewarding effects when you go to a certain event or place, like the Christmas market in Germany. Entering the honey shop, only to get the lights turned off as they entered and shown the door a second later. 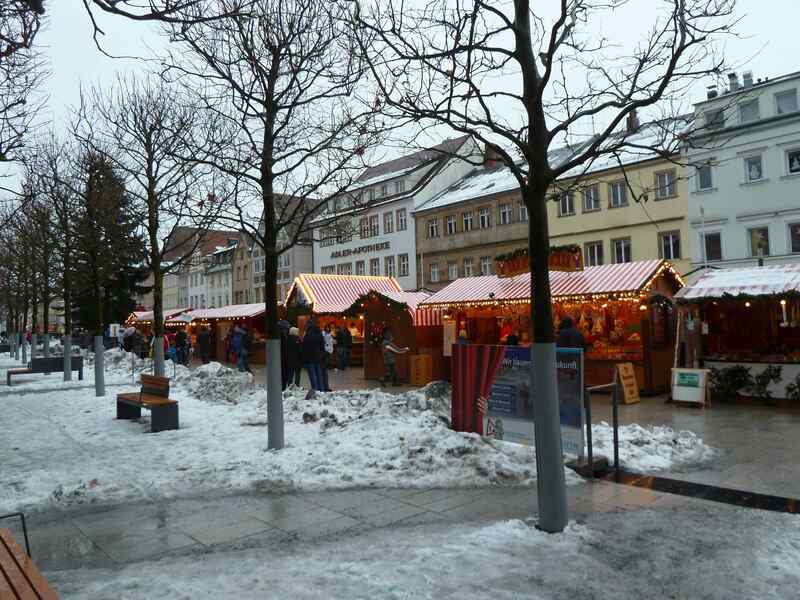 After putting up with the overcrowding visitors at one of the most popular Christmas markets in Germany, the next stop on the Christmas market tour is an hour to the north in a small and quiet town of Bayreuth. The capital of the region Oberfranken (Upper Franconia) is located not far from the source of the Main River, which slithers its way for over 400 kilometers down to the mouth of the Rhein River in the twin cities of Wiesbaden and Mainz (both are west of Frankfurt/Main). Like Jena, Bayreuth is one of those forgotten cities where people pass through enroute to either Berlin or Munich along the North-South corridor A9, and there is a good reason for that. Bayreuth is one of the biggest sleeper towns in Germany with most of the recreational possibilities located in the Fichtel Mountain region to the north and east. Its population consists mainly of those ages 40 and up and even though its main attractions include the university and the places associated with Jean Paul and Richard Wagner, the town almost always sleeps early every night of the year. That means after 7:00pm, when the stores close their doors for the evening, the whole city center becomes silent in a fashion resembling Steven King’s The Langoliers- the silence when walking through its main street Maximilianstrasse is as eerie as it gets. However, not all of Bayreuth is as silent as the airport where the passengers were stranded in, like in the film The Langoliers. There are two time periods in the year where the city of 70,000 inhabitants is the liveliest (that is, if you subtract the basketball season in the winter time and the professional basketball team BBC Bayreuth). The first one is in July, when the Wagner Festival takes place at the Festspielhaus, located on the hill overlooking most of the city. 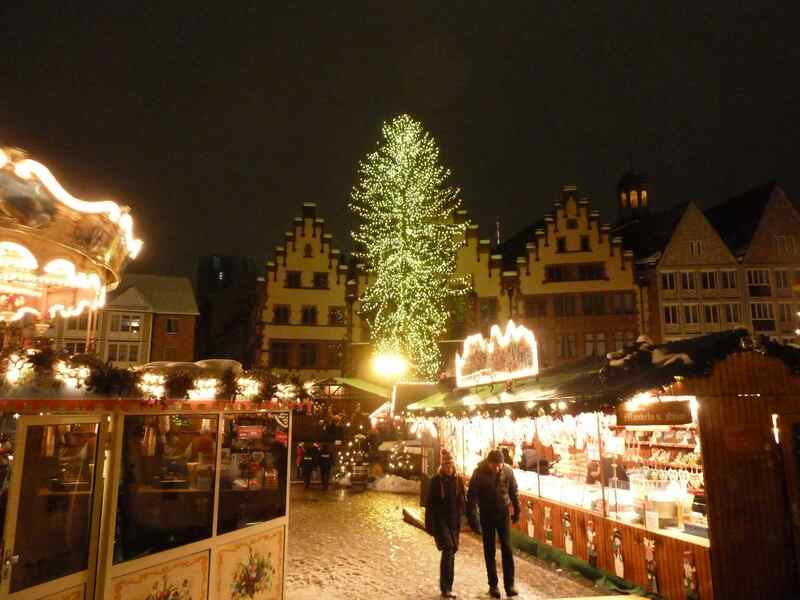 The second one is the Bayreuther Weihnachtsmarkt, which takes place the same time as the market in Nuremberg. Like the lighted garland which runs along the Maxmilianstrasse through the city center, the Christmas market consists of booths running along the main street beginning at the west end where the Hugendubel book store and the Karstadt department store are located and ending at Sternplatz on the east end, where the bar complex Winterdorf is located. While most of the booths close up early at 7:00pm every night, the Winterdorf part of the Christmas market is open until late into the night- far later than the Glühwein booths at the Christmas market in Erfurt, which really took me by surprise given the fact that Erfurt is three times as big as its Franconian counterpart and has a very stark contrast in terms of its liveliness as a whole. 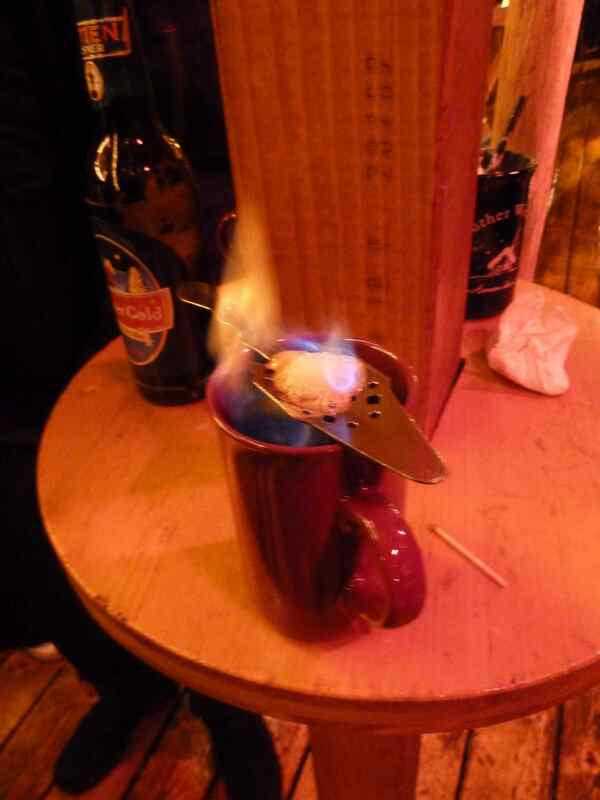 If one wants to try all the concoctions in the world, ranging from Feuerzangenbowle in a cup to Winter Dream, to Nürnberger Glühwein (see the attached links for the recipes of each) then Winterdorf is the place to be, where the female bar attendants are nice looking and customer friendly, and the reunions with old friends and colleagues take place. I had the opportunity to meet up with my friends and former students at the Winterdorf, as I taught for two years at the university and they were my regular customers in all the English classes I taught there. It was a fun time as we talked about our lives in English and provided each other with some laughs and memories of the times together in the classroom, drinking all the beverages possible. Many of them I still keep in touch with through all forms of communication, as I made a difference in their lives during my two years in Bayreuth, and they made my stay a memorable one. But aside from all the memories, another reason for nominating Bayreuth as one of the pics is its improvement with regards to city planning. In the past five years, the Maximilianstrasse was converted from an underground bus station with through traffic on the surface to one which presents some unique lighting and sculptural designs with two thirds of the street now being converted into a pedestrian and bicycle zone. The bus station is now located just off the bypass Hollernzollern Ring, which runs along the Main River. During the time I was in Bayreuth, much of the street was ripped apart for the beautification process, and most of the small shops at the Christmas market were relocated along the side streets. The entire stretch of shops between the west and east ends was completely blocked off. When I visited the market this time around, it was a whole different story. New lighting, new trees lining up along the streets, and the stretch of small shops was reestablished, making the Bayreuth Christmas one of the most hidden treasures that a person has to take a couple hours to see. While many students have claimed that Bayreuth has only Richard Wagner to offer and that the city should do more to improve its image, they are only half right. Little do they realize is that Bayreuth does offer one thing that will make their stay a wonderful one, which is its Christmas market. After all, it is the place where friends meet and/or reunite and for those without a partner, one might get lucky there. And now the last stop on the Christmas Market tour, which requires a good 400km trip down along the Main River in one of the most popular metropolises in Europe, Frankfurt am Main. But before that, here are some recipes of beverage mixes worth trying for the holidays. West end overlooking the book store and old town hall. Inside Winterdorf, where the drinks run wild and the guest are even wilder.